Grey studied at the Winchester School of Art in Winchester, England, earning a Bachelor of Fine Arts. She now lives and works on the west coast of England. 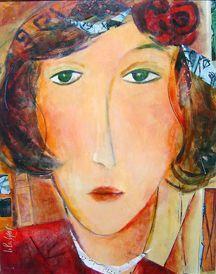 She is known for her dramatic use of color and her contemporary sense of composition. Her specialty is the encaustic method, with colors enhanced by layering “washes” of wax and paint. She is also a passionate gardener. Her work is exhibited at the Taunton Art Gallery, Somersett; The New Bristol Gallery; the Bath Lanes Gallery; the Hove Art Gallery and Museum, Hove, Sussex; and the Beecroft Gallery, Southened, Essex.